How can a professional photographer locate the best shooting locations in a vacation spot like Key West? Well, he can contact the local film bureau for a list. But if no film bureau exists, the photographer can simply book a site-seeing tour once he gets in town. For a male model shoot in Key West, the project's photographer and assistant simply booked a tour aboard the Old Town Trolley Tour of Key West - which took the crew every possible scenic spot on the island. The Trolley takes sightseers to every point of interest and explains the history behind the spot. The Trolley saves participants from becoming hired from walking on foot and you do not need to bother with parking your car or bicycle. The trolley drives you everywhere. He took notebook paper wrote down all the locations that looked good and followed up after the tour was finished. A similar tactic can be used for wedding locations in Key West. Just buy a Key West Sightseeing DVD, watch it and contact the location to learn what they charge to hold a wedding. Trust us, all locations on the DVD will let you hold your wedding at their location! You will also likely find a more open schedule by choosing beyond the norm locations that every other wedding party has not booked. So, if you are a photographer looking for locations for photo shoots, visit the spot and book a tour on your first day. You will see every spot possible. The new way to become a portrait photographer is to order the Flip video camera. You use it to make quick and easy videos of students on a campus near you. Photography isn't all about stills anymore. The Entitlement Generation (those born after 1980) want to be video taped, not just photographed. They grew up with camera on their cell phones. For older people, the Polaroid One Step camera was a prized household item that was kept under lock and key by dad. Kids normally have camera on their key chains. By registering as an Official Photographer for for "Campus Man of the Day." 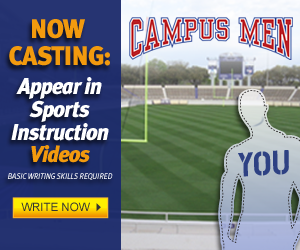 , you will have the ability to upload videos of students you recruit in your city. Students allow you to tape them and then they can use the video to promote themselves.